Friday, September 13, 2013, 7:00 p.m.
Auburn High goes on the road for the first time in the 2013 season when the Tigers travel to Smiths Station in the 24th meeting between the two schools on the gridiron. The 7:00 p.m. CDT will be broadcast live on WGZZ (94.3 FM), WMXA (96.7 FM), online at wingsfm.com/ and http://www.ustream.tv/channel/smiths-station, and on TuneIn Radio at tunein.com/radio/Wings-943-s98678/. Auburn and Smiths Station are meeting for the twenty-fourth time in series history. Auburn High is 17-6 all-time versus the Panthers, having won the last eight meetings and 14 of the last 15. On the road, the Tigers hold a 7-4 record over the Panthers. This year is the 22nd consecutive season that Auburn has played Smiths Station, making the Tiger-Panther matchup the third-longest consecutive series on Auburn’s current schedule, behind Opelika (81 consecutive seasons) and Central-Phenix City (30 consecutive seasons). The current Auburn-Smiths consecutive season streak is the seventh-longest in Tiger history, behind Opelika (81 seasons, 1933-present), Valley (38 seasons, 1962-1999), Central-Phenix City (30 seasons, 1984-present), Handley (27 seasons, 1944-1970), Lanett (27 seasons, 1949-1975), and Tallassee (27 seasons, 1947-1973). Auburn is 47-40-6 all-time in recorded road openers (.538) and has won 18 of the last 26 road openers, including five in a row. The Tigers have never played at Smiths Station in a road opener. The Auburn offense has scored 110 points this season, the most of any 6A school through two games and the sixth-most of any school in Alabama. Auburn’s average margin of victory in 2013 of 46 points is the largest among 6A schools and the 7th-largest of any high school in the state. Three of the twenty-two games between Auburn and Smiths Station have gone to overtime, with the Tigers winning all three (1995, 2002, & 2003). Of the 16 overtime games Auburn has played Smiths Station is the most common opponent, with only two other schools (Prattville & Sidney Lanier) having met the Tigers more than once in OT. Since 1995, Auburn has gone into extra periods five times, with Smiths Station the opponent in three of those games. Smiths Station is one of four schools from Lee County that the Tigers have met on football field. Auburn is 59-50-3 all-time against other Lee County schools, holding a 17-6 record vs. Smiths Station, a 41-43-3 record vs. Opelika, an 0-1 record vs. the World War II-era Naval Radio Training School at Auburn, and a 1-0 record vs. Central-Phenix City before Phenix City was ceded from Lee to Russell County in 1932. Since 2003, Auburn has only lost two games away from home in the month of September. Auburn has a 12-game winning streak in away games, dating back to 2010, and has won 16 straight region games on opponents’ fields since 2008. In addition to his record-setting number of field goals, Ledbetter’s 46- and 45-yard field goals rank as the 8th- and 9th-longest in Auburn High history. Last week’s win over Jeff Davis was head coach Tim Carter’s 70th win as an Auburn High Tiger. Carter has quickly risen through the historical ranks of AHS head coaches. He holds the marks among Auburn head coaches of fastest to 20 wins (29 games), 30 wins (40 games), 40 wins (50 games), 50 wins (63 games), 60 wins (75 games), and 70 wins (87 games). Carter’s 70-17 record places him second on the Auburn High all-time wins list, behind long-time coach R. L Beaird (96-90-11, 1945-1965). Carter holds a winning percentage at Auburn of 0.805, the best career winning percentage for an Auburn High head coach since the single-season careers of Carson Greene in 1926 (0.833) and Charlie Gibson in 1923 (1.000). Auburn High has won twelve straight games away from home, the longest streak in Tiger history. Since 2008, The Tigers hold an 23-2 record outside the friendly confines of Duck Samford Stadium, with the Tigers’ only road blemishes coming at Oxford in 2010 and top-ranked Prattville in 2008. Auburn two road losses since 2008 is the fewest of any 6A program over that time span, edging Hoover’s four losses away from home. Auburn is the second-winningest AHSAA class 6A program since the beginning of the 2008 season, with 55 wins. Only Hoover (71 wins) has more wins than Auburn High over the past five seasons. Since 2008, Auburn has won or tied for every region title and boasts an overall region record of 32-2. Auburn’s region winning percentage of 0.941 is the highest recorded over a five-season period in Auburn’s region or area since 6A play began in 1984, eclipsing Opelika’s five-season area winning percentage of 0.857 from 1990 to 1994. Entering its 46th season as the home of the Auburn High School Tigers, Duck Samford Stadium is the 2nd-largest single-school stadium in AHSAA Class 6A, with a capacity of 8,310. The Tigers are 160-97-1 (.622) all-time at Duck Samford and are 35-8 (.814) over the past 5 seasons within the friendly confines of “The Duck”. Auburn has received one or fewer losses at home in five of the last eight seasons and has seen only one losing season at home since 1999. Since 2007, Auburn is 24-1 in games played in the month of September. AHS won 15 straight September games between losses to Jeff Davis in 2006 and Oxford in 2010, and currently holds a nine-game win streak in the ninth month. Over the last eleven seasons, Auburn High has lost only two games in September away from home. Historically, Friday the 13th has been a unsettling date for the Tigers. Auburn High is 13-14 all-time in games played on both the 13th of the month and a Friday. Auburn improves its all-time record to 546-355-33 (.602). Auburn has won six consecutive season-openers, as well as 20 out of the last 27. The Tigers’ overall opener record improves to 52-36-10. Auburn moves to 71-17-7 in home openers (.784), having won the last seven and 21 of the last 27. Auburn has won ten straight over Valley, the longest winning streak in the series by either team. Auburn has now won 95 of 97 games when scoring more than 35 points. The Tigers’ 65 points is the 2nd-most in program history (behind a 72-0 win over Fairfax (Valley) in 1934) and the 65-point margin of victory is the second-largest ever by Auburn. The 65 points given up by Valley is the second-most ever given up by the Rams and the margin of defeat is the second-largest in Valley history. Auburn has outscored Valley 264-57 over the past six games, with an average score of 44-9.5. Auburn and Valley have now both handed each other the worst two losses in program history. Auburn defeated Valley 72-0 in 1934 and 65-0 in 2012, while Valley defeated Auburn 53-0 in both 1959 & 1963. Nine different Tigers scored touchdowns, a program record. A lightning delay suspended play with 2:06 left in the first quarter, at 7:38 p.m. CDT. Play resumed 42 minutes later, at 8:20 p.m.
Auburn has won 13 of the last 17 games in the month of August, including seven straight. Tim Carter is now 69-17 as head coach at Auburn (.802). The Tiger defense pitched a shutout for the first time since 2009 (10/9/2009, AHS 37, Russell Co. 0). It is the 176th shutout in program history. The Auburn defense allowed Valley only 3 yards of total offense in the first half. Friday, August 30, 2012, 7:00 p.m.
Auburn High begins its 103rd year of football when it hosts Valley in the 53rd recorded meeting between the two schools on the gridiron. The 7:00 p.m. CDT game is the season opener for both squads and the home opener for the Tigers. The game will be broadcast live on WGZZ (94.3 FM), WRNK (96.3 FM), online at wingsfm.com/ and wrnk.org, and on TuneIn Radio at tunein.com/radio/Wings-943-s98678/. Auburn High has a 51-36-10 record in season-opening games. The Tigers have won 19 of the last 26 openers, including the last five. Auburn’s 51 season-opening victories is the second-most of the eight schools in 6A Region 3, trailing only Sidney Lanier’s 66 wins in openers. Auburn is 70-17-7 all-time in recorded home openers (.835) and has won 20 of the last 26 home openers, including six in a row. The Tigers are 33-11-1 in home openers at Duck Samford Stadium. Valley, which will face the Tigers for the 53rd time this year, is the second-most-often-played opponent in Auburn High football history, behind Opelika’s 87 recorded contests with the Tigers. Auburn leads the overall series with the Rams, 27-24-1. Auburn has won nine straight over Valley and eleven of the last thirteen in the series dating back to 1994. Auburn’s current 9-game streak over the Rams is the longest in the series by either team, eclipsing the Rams’ 1986-1993 run over the Tigers. Valley has been Auburn’s second-most common opponent in regular season openers, with thirteen games between the two schools on season-opening dates, behind only AHS-Tallassee’s 22 openers. The Tigers own a 10-3 record over the Rams in openers, including a current streak of seven straight. Auburn’s matchup with Valley will be the Tigers’ 60th against a AHSAA Class 5A opponent since the current six-classification system began in 1984. AHS holds a 38-21 record against 5A opponents and currently sports a 13 game winning streak versus 5A schools dating back to 2003. Auburn High ended the 2012-2013 athletics season with a documented record* of 1665-326-10 in all sports. This is an overall winning percentage of 0.835, an improvement over 2011-12’s 1547-329-12 (0.823) & 2010-11’s 1179-393-8 (0.749). The Tigers had winning records over 350 of the 414 schools competed against in 2012-13, and only had losing records against 9 of the 187 schools that AHS played more than twice. Auburn High was unbeaten vs. 280 of the 414 opponents’ schools. Auburn played 63 AHSAA Class 6A schools in 2012-13, amassing an overall record of 803-174-5 (0.820). The Tigers held winning records vs. 61 of the 63 schools in class and were unbeaten in competition with 33 of the 63. Nearly half (78/174) of the Tigers’ losses to Class 6A schools came at the hands of just five programs: Mountain Brook (21 losses), Hoover (18 losses), McGill-Toolen (14 losses), Vestavia Hills (13 losses), and Smiths Station (12 losses). On average, Auburn’s record against each 6A program was a respectable 13-3. As Auburn High completes another successful athletics year, let’s look back on 2012-13. Men’s track ended the season as state champions. It was the program’s eighth state title and the first since 1972. AHS has won at least one team state title in 8 of the last 10 years. Opelika for baseball and softball matchups. So far in the 2012-13 school year, Auburn and Opelika have competed 46 times, with Auburn winning 40 and Opelika winning 6 competitions. Friday, November 23, 2012, 7:00 p.m.
Auburn and Opelika meet in a rematch of an October 26 contest in the quarterfinals of the Alabama High School Athletics Association Class 6A playoffs. The Tigers won the first meeting, 32-23, at Duck Samford Stadium. The matchup will be the 87th recorded meeting of the longstanding rivalry, and is the first time the two teams have met in the postseason. The 7:00 p.m. CST game will be broadcast live on WAUD (1230 AM), WTGZ (93.9 FM), WKKR (97.7 FM) and online at sportscallauburn.com. 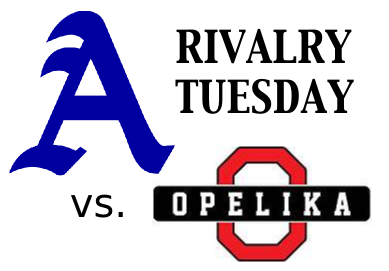 Auburn and Opelika are meeting for the eighty-seventh time in series history. Opelika leads the overall series, 42-41-1, but Auburn has won the last five and six of the last nine. Opelika also leads the series when played in Auburn, 21-17-1, and holds a 12-11 edge over the Tigers in games played at Duck Samford. This eighty-seventh meeting between Auburn and Opelika is the first between the two schools in the post-season and is the first recorded rematch in series history. The last time that consecutive Auburn-Opelika games were played at the same site were the games of 1949 & 1950, which were held at Felton Little Park in Auburn. A win by Auburn will even the series with Opelika at 42-42-3. The last time the series was knotted was 1999, when the schools were tied 35-35-3. This week’s game will be the Tigers’ fourth quarterfinals appearance. Auburn is 2-1 all-time in the quarterfinals of the AHSAA playoffs. Auburn picked up quarterfinal wins in 2001 & 2009, defeating Baldwin County, 20-10, and Daphne, 44-10, respectively. Auburn High’s only quarterfinal loss came in 2008, when the Tigers fell, 42-0, to eventual state champion Prattville. Auburn’s opponent, Opelika, has four more quarterfinals appearances than the Tigers, but the same number of quarterfinal victories; the Bulldogs are 2-6 all-time in 3rd-round games. Through 86 meetings, the Tigers and the Bulldogs are separated by just 73 points; the average score in the series is Opelika 15.4, Auburn 14.5. Thus far in the 2012-13 school year, Auburn and Opelika have competed sixteen times in four sports. Auburn High has won all sixteen matchups, and has won the last 20 meetings between the two schools in any sport, a streak dating back to May 3, 2012. Auburn has won 27 of the last 28 competitions between the two schools, with the only blemish being a 5-3 loss in softball on May 3 in which the Tigers left eleven runners stranded on base. A win over the Bulldogs this week will give Auburn a sweep over Opelika in the fall sports. Auburn has won twelve straight away from home, a Tiger record. With last week’s win over McGill-Toolen, Auburn improved its post-season record to 14-16 overall, including a 13-15 record in the AHSAA playoffs. Auburn High now has an all-time record of 545-354-33. Auburn enters the national rankings for the second time this season, ranked 93rd in the United States in both the Rivals 100 and the Freeman Ratings. In 2012, Auburn’s defeated opponents have 59 wins, while Opelika’s defeated opponents have 38 wins. A win by Auburn will give the Tigers six straight over the Bulldogs, which would be the longest streak over Opelika by any team since Robert E. Lee won ten straight over OHS between 1956 and 1996. It would extend the Tigers’ third-longest streak over the Bulldogs, behind Auburn’s two seven-game streaks over Opelika from 1967-73 & 1976-82. Auburn has scored 460 points on the season, which is the second-most in Tiger history. The 2012 squad would need to score 53 more points before the season ends to break the 2009 Tigers’ record of 513. Auburn’s 11 wins thus far in 2012 is the third-most wins in a single season in AHS history, behind the 2009 Tigers’ 13 wins & the 2008 Tigers’ 12 wins. Have you ever had lunch on the Hill? Gotten turned around in the 500 building? Do you secretly prefer Auburn football Friday nights to Saturday afternoons? Do you get chills when the Alma Mater gets to "Dear Ole Auburn High?" Have you screamed your head off after a one-handed jam on Frank Tolbert Court or sung "Hooray for Auburn" with 8,000 of your closest friends at the Duck? If so, you might BleedRoyalBlue.